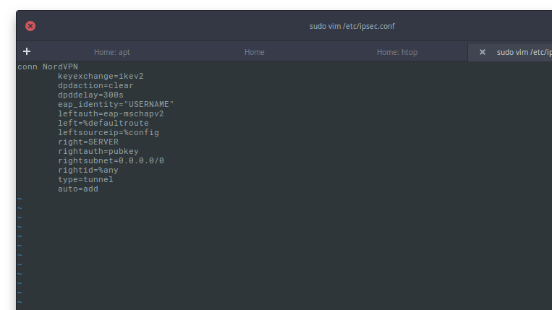 This guide utilizes the Strongswan packages to manage the IKEv2/IPSec connection on Linux. This guide covers the basic debian based guide, however, it should work the same on other distributions. Note: For arch based distros and others, you might not have libcharon packages, as they are in the strongswan package. You can just run: pacman -S strongswan and it should be enough. 3. 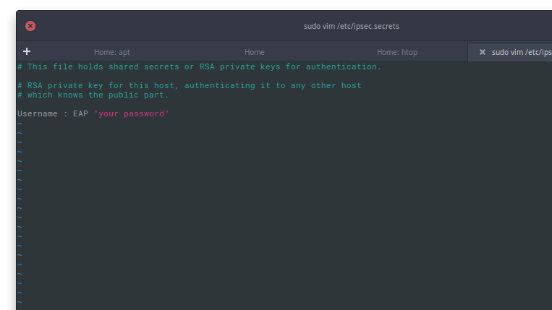 Now, we need to edit ipsec.secrets file with your NordVPN username and password. 4. Change Username with your NordVPN username and your password with your password. Your password has to be warped inside double commas, and NOTICE the spaces after username, after “:” and after EAP. 5. Once again, use preferred text editor to enter /etc/ipsec.conf file. Do not forget root privileges since file is write-protected from anyone except root. Change SERVER to the hostname of the server you are going to use, and USERNAME to your NordVPN username. For this guide, we used the US#1019 server. Inside the file change load = yes to load = no. 9. Now we will need to download our NordVPN RSA certificate. 10. Now let’s restart ipsec in order to reload all configuration files. If you’ve made any typos in /etc/ipsec.conf file you’ll be notified when service will be trying to start. This command should show the output “connection NordVPN has been established successfully”. Note: if you are receiving No config named 'NordVPN' error after running the ipsec up NordVPN command, please refer to this article. And send it to our support!